Who is responsible for viewing and claiming users suggestions ? Where may I post (here or in git ?) my very important suggestions ? I can’t live without it, and it’s very flustrating to code without them for me. Please be honest and tell me, where may I post to be seen by NP++ developers. It’s good suggestions for everybody. I just need to be sure, the competent person will review it. Either here or on Github. Nobody is really “responsible” but normally someone will see it. And not every feature/suggestion gets a response or even implemented. I would like to kindly suggest features which probably aren’t difficult to implement and won’t be overwhelming or contraproductive. I strongly believe, they are very useful. 1, Ability to delete autocompleted part of dual symbols ( parenthesis, brackets, curly braces, single, double quotas…) when Backspace is pressed immediatelly after first autocomplete dual symbol is written. It’s good for saving time to delete autocompleted part when you mistyped it. For example you typed single quotas instead of double ones. Or you typed correct symbol but with space before needed or non needed. So in all cases, you would need to delete autocompleted part. 2, Ability to remember or recognise tabs and spaces in file. It’s for purposes when tabs are replaced by spaces. But when you would go back in indentation, you need delete all spaces instead of one Backspace press. It takes many key button presses and time. It would be handy when in already replaced tabs by spaces, will Notepad++ recognise that indentation happend by tab press and also will operate with it as tab during deleting spaces. 3, Ability of Run module to be able run scripts in console just by one key button without asking or prompting anything before or after execution. You would simply set path to for example python and then set F5 to execute code automatically. There is no plugin for NP++ which would make it easy and efficient. and it is set to disabled per default. 2 and 3 are already part of npp, it is just a matter of setting it up once. I don’t think that #2 is already in N++. When I press tab (after configuring to insert 4 spaces per tab), I get the right number of spaces inserted. However, to remove all of the spaces, I have to hit backspace 4 times. The requester is wanting ONE press of the backspace key to remove all of the inserted spaces. I believe that #3 can be achieved with the NppExec plugin, but perhaps with the first run specified, but then all subsequent runs that are the same executed with a single keypress (no prompting). save your commandline and assign a shortcut. You are of course right on the back-tab, but in practice most people (programmers!) expect backspace to also work the same way. So I think that is what the OP (original poster) is getting at. Grabbing the Shift+Tab is a bit burdensome. I just backspace them all away but I could see where this bothers some people. Yes Scott. Finally someone who read carefully what I meant. #2 and #3 IS NOT possible to set with npp exec. I haven’t opened NP++ whole day all days. So just first configuration for npp exec is not a solution for me. AND I still need to stop process executed in console, even it’s a stupid print() statement ! That plugin is wrong because nothing is in execution like infinite loop. Please understand that npp exec is not made efficient way, and definitelly not as I need it to. Shift +tab is not solution for me. I need like I described it above. And I add one more. NP++ has great advantage of simple GUI enviroment in compare with uber difficult Atom.io notepad. So why the heck, is so hard to add one option to reset all keys to default ? I meant I’m not working on my pc with whole days opened NP++. I open it when I need it. And dont want every time configure npp exec, when it’s possible to code it just to press one key to execute script without prompting and ending anything. which might help the OP to use it instantly instead of waiting to get it implemented. I guess I need to clarify a few thinks. If I wasn’t careful then I guess I could argue you weren’t too. feature which could do this. Notably Run. Please reread my answer to Scott. I haven’t opened NP++ whole day all days. So just first configuration for npp exec is not a solution for me. efficient way, and definitelly not as I need it to. NPP Exec modification request to execute code by one press without prompting. carefully. Ok, what did you describe? 2, Ability to remember or recognise tabs and spaces in file. It’s for purposes when tabs are replaced by spaces. But when you would go back in indentation, you need delete all spaces instead of one Backspace press. Here you mention backspace, correct, but not in the rest of the post. No statement that backspace is the only allowed key to solve your issue. It takes many key button presses and time. and also will operate with it as tab during deleting spaces. backtab could do it but you don’t like, I got it. There is NOT simple way how to reset key binds to default. If editing a file and delete the user-configured key bindings isn’t simple, then yes, you are correct. Note sure, did you miss a me? About resetting key shortcuts to default. There is not such file I swear ! There is not a file with customized key binds. I assume, you meant to delete that file (but it does not exist) and then NP++ will make default one in next run of app. About NppExec plugin vs. default ability of NP++. It’s bad because it immediatelly closes after code execution. I won’t be even see result, it’s that fast closed. Therefore I need splitscreen console like with npp exec ! Please understand that. And about removing tabs, to be 100% clear, I will describe it again different way. When I want remove tab indentations which were easily made by just Tab key pressing, I want same easy way of removing them by Backspace pressing. Not four times more, as remaked to spaces. I know I made tabs, so I don’t want delete spaces. NP++ should distinguish it. And I don’t want use and remember special key bind shortucs just for this case, when app can do it instead of me. Thanks for reply anyone who is responsible to implement all changes to NP++. Please everybody consider my suggestions. It’s not stupid ideas and nobody will be hurt. Just not tick it up in Preferences. But when those features are missing, people will be hurt. just a quick update to F5 Run configuration, 'cause I’m already on the run again (not sure if this is the correct translation). replaces the variable to c:\test.py of course but this is done automatically so you stick with the variable. 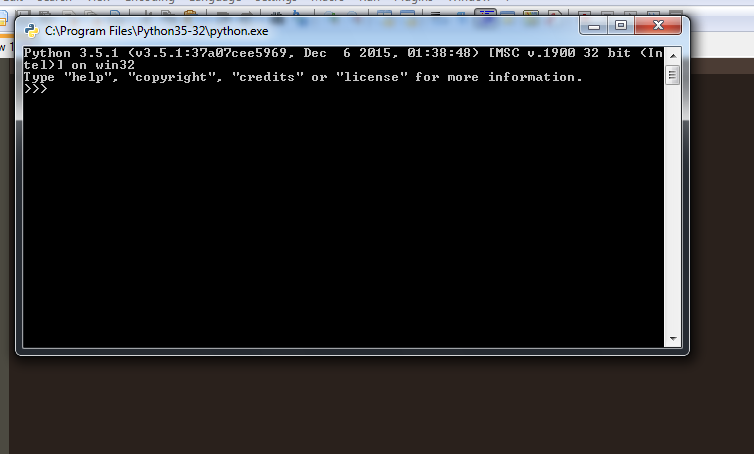 a command prompt gets opened and python executes the active document. Update regarding the others topic will be posted after I come back. I don’t go into detail as it is already described here. So the difference are your changes. because you have more control about what needs to be executed and how to handle the returned output. close the cmd shell after executing a program/script. you get the Execute… dialog. Run(F5) configuration we do NOT add cmd.exe in front of python. You should see the output of your python script in the NppExec console. and reconfigure it. NppExec is normally on the very top of the list. and every other execution can be started with CTRL+F6 again. 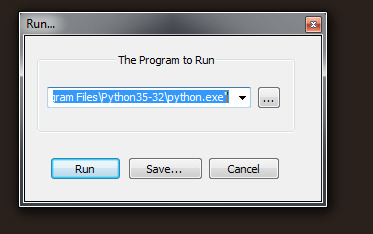 and then press save and give it a meanigfull name like Python35. Do the same for the second python install. 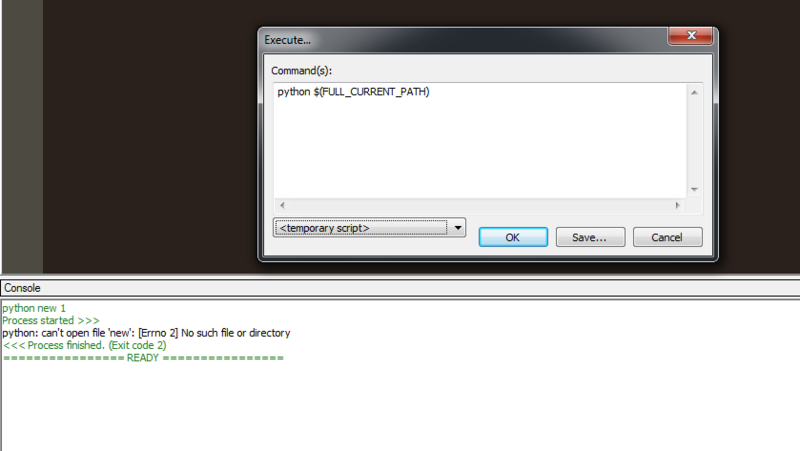 Now you have to call Execute… dialog everytime you want to switch between the two Python installations. But this is normal, I guess, how should npp/NppExec know which python interpreter should be called? There are other useful features which I can describe if needed. I want same easy way of removing them by Backspace pressing. Not four times more, as remaked to spaces. I know I made tabs, so I don’t want delete spaces. when app can do it instead of me. I have absolutely no problem with it. If you want to go with it and devs are willing to do, I’m fine too. SHIFT+TAB to reverse things done by TAB, isn’t that complicated, is it? are >300 issues/feature requests open. It might take a little time before it gets considered. File I was executing, I have on my Desktop. It was there, so I don’t know why this error. 1, Installed fresh npp exec plugin (during install I saw this: http://i.imgur.com/67MhHR2.png). 2, Now I deleted that cmd /k saved command F6 by native Run thing. 4, Normal Execute in plugin is F6 and that one press is ctrl+F6. Now I have just switched those two. So when I open NP++, press F6 and it pop’s up that window. I hit Enter and from this moment I can just F6 anytime and it executes it. It’s good. And it does not prompt me to stop execution. Now it’s ok. But it has same problem with that file like python shell had, I dont know what’s going on. 5, Now I see disadvantages (they are problems to me !) with console in compare with pythons IDLE. Console has not history I can view between presses F6. For every new F6 it’s new thing, I cant see what was executed before to see changes. I need it do like IDLE does. And when I want reset/remove all variables or remove screen to blank - no history, I need set too, like it is able in IDLE. How please ? Wait a second, I was wrong, I was mixing apples with pears. IDLE which is ineractive interpreter + it’s notepad. But still, there is need to see prevoius outputs and when scrooling is too much, then clean that console screen. This I would like to do in that. Thanks for any help. I’m happy someone is helping me with kind of trivial things, but I really don’t want IDE like Pycharm or other pro tools. It’s overwhelming for beginner. And at the same time, IDLE teachs you bad habits, because it’s real time interpreter and sometimes result can be different from script saved in file. That’s why I want use notepad++ (aka scripts wrtitten in files), but at same time, to see result in console in same window - spitscreen, which is advantage of IDLE. I hope it’s all clear now and I hope npp exec has those things I need to. have a 3 minute window to do it. methods you always start a new process. No cached informations of previous processes output. (I cant recall it from saved Run shortcut. How do it ?) something like: cmd /k python $fullpatch$. 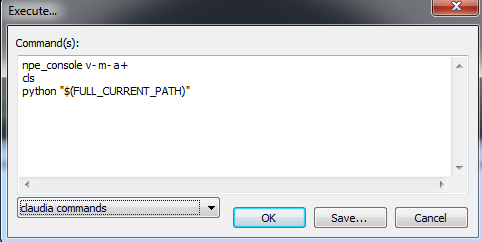 Once saved it appears in the Run menu, to see what it does you need to take a look into shortcut.xml. The command was the same as you put in NppExec except the added cmd /k infront of it. why not scrolling in the web browser up? Could it be that you have spaces in your path? 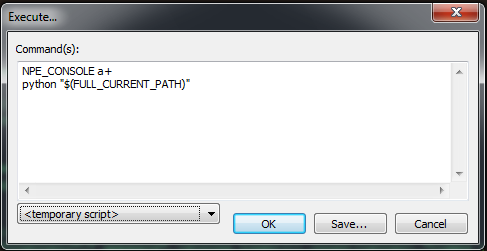 If so, windows has this issue since ages, to get around this surround the $(FULL_CURRENT_PATH) by double quotes. Don’t know what plugin manager wants to check - need to investigate. to the file, if you don’t save you run the old copy of that file. You type into the console. cls clears the output window. Output which I need to see is just 6, 9. Other stuff is no needed, is possible to not show it ? Because it’s filling screen too much and I have small monitor. When I type ‘cls’ into console, it clears nice :) What else useful may I write into there too please ? Thank you very much for helping me ! This saves me days of googling or asking on other forums + getting minuses on my account on stackoverflow leading to no permission to post anymore. Users who gained a lot of experience numbers are just minus all newbies like mafia. It’s almost unable to get some experience numbers. But not anymore about it. Lets focus on this issues. and e.g. help npe_console to get detailed informations on that particular command. save it with a meaningful name and press either ok or cancel, doesn’t matter. choose your previously saved script. 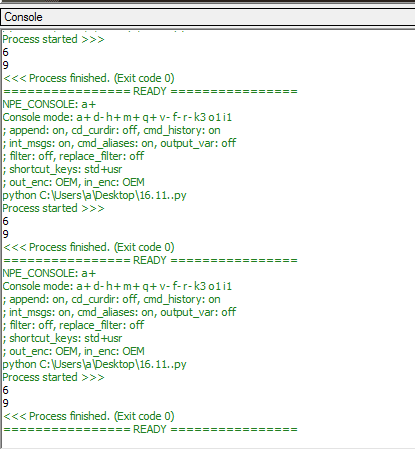 so select the python profile, delete the npe_console a+ and save it. It’s is not what I need, because cls command delete everything outputted before. But I need history of outputs, I need clear just those redundant stuff. But I need to compare outputs based on my code changes. Is possible to modify it under my needs please ? I don’t want run that script on every start of NP++, because I still need code stuff and then see result. So we keep it by F6 pressing. Because in every new NP++ run, I don’t want see console at first, I need code something without splitscreen. This untick can not keep it’s value between starts of NP++. Can it be somehow forced to not show console on each start please ?